Spider is part of the ‘Toddlerzone Plus’ range and is designed to a natural theme with gently waving panels a ‘natural colour palette’ and themes and motifs that reflect the natural world. 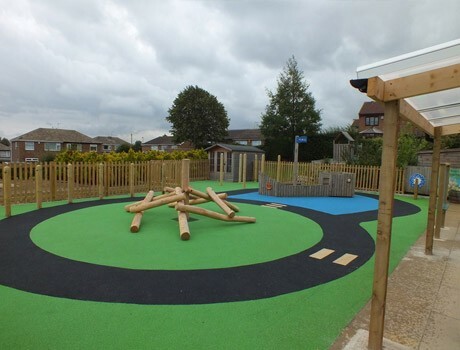 It has been designed to maximise activities, whilst utilising space under the decks and on the posts while minimising surfacing requirements. A compact configuration uses a square and tri-platform with an upper and lower deck (0.9 & 1.2m high). 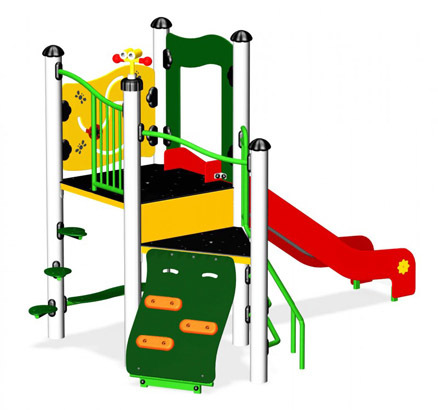 An inclined climbing ramp with feature climbing blocks and hand holds and a simple steel ladder with handrails provides two levels of difficulty to access the Spider. The space under the deck is utilising multi level play opportunities by incorporating a seat under the higher deck, creating a sheltered social space. A new leaf stepper, utilising a corner post of the higher deck, uses three ‘foot sized’ leaf shaped steps arranged in an arc. These require a higher degree of coordination and encourage children to grow in confidence and skill. 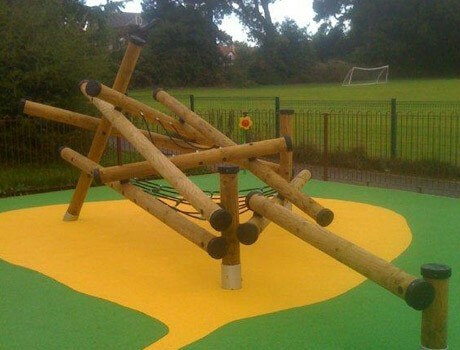 A binocular rail for spying on wildlife is sited on a post, incorporating a swivel and hand grips, a circular finger maze and a ‘spider catching flies’ pathway panel add to play on a micro level, adding moments of delight as children play.